The temperatures may still be hitting the high 90's on a daily basis, but as far as Japan is concerned, autumn has arrived. You can tell this by the fact that fashion victims are already donning their fur-lined Ugg boots and wearing sweaters and jackets designed to keep bones from catching a chill (as opposed to the thin ones worn to protect delicate pale skin from evil tanning rays). I know because the sweets varieties are starting to change. The rows of "ice lemon" are being replaced by sweet potato and chestnut. Apparently, we need to focus on roasting tubers and nuts despite the fact that every day is a slog through an overheated bog. All of that whining about the weather aside, with the equinox coming up (Sept. 23), the weather may actually be turning from "cook on high" to "slow simmer" soon. And, of course, I'm very happy to have the fall line of treats on the shelves. I'd probably trade them all for about a month less of sweltering heat, but that's not an offer that has been made to me so I'll settle for trying this marron (chestnut) cake. I found this at Inageya supermarket for 198 yen ($2.59) for 6 tiny little cakes. Each is only about 5 cm x 4 cm (about 2" x 1.5") and packs a pretty decent calorie punch for that size at 103 calories per cake. The cakes are a multi-layered affair with a "fluffy" yellow cake base with a "fluffy" chocolate cake on top of it. The chocolate layer has bits of chestnut and another layer of yellow cake with a drizzle of chestnut "chocolate". The construction is sophisticated and one would hope would add a depth of flavor from the various layers. Unfortunately, it doesn't really work particularly well in this regard. Rather than each component bringing in different flavors on the tongue, it all seems to come together as a melange of mild chestnut flavor (from the coating on top), weak chocolate, and general sweetness. The chestnut pieces are too tiny and scarce to really get much play on the taste buds and enhance the flavor and the yellow cake seems to be pretty much flavorless. 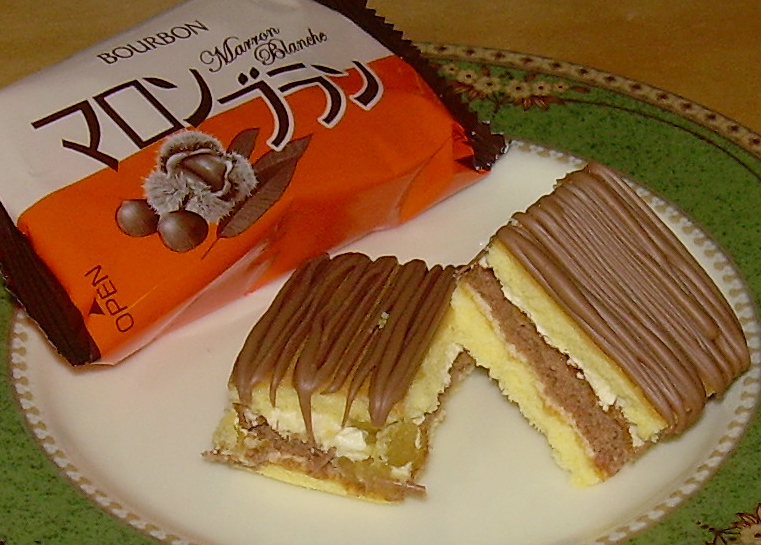 There are some interesting textural inter-plays with the soft cake, chestnut pieces, and slightly crispy drizzle on top, but this is undermined by the fact that the cake is clearly prepared for a long shelf life and has that moist but dry feeling that such cakes often have. This isn't a bad bit of cake at all, but it's just not particularly great either. If I could have bought a small pack with two or three of these, I wouldn't have regretted it, but I'm not sure that 6 of them isn't more than I require given the relatively low quality of the taste experience. I wish the cake were actually "fluffy" or had more flavor, that there was a creamy filling of some sort, that it was a bit less sweet, or the chestnut flavor were just more robust. I'll finish this box, but it's going to take awhile and it's going to be more about a texture craving (for cake) than about being over the moon about the flavor. I know its Autumn in Japan when the Tsukimi burger starts to appear. No way! Uggs is still "in" at Japan? I thought it went out of style. 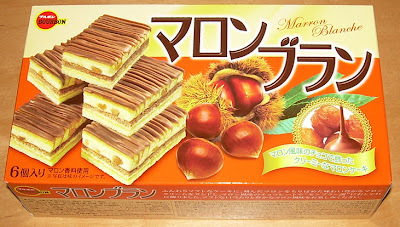 I like the idea of a chestnut-inspired cake, but I much rather had fresh roasted chestnuts...nothing quite like it!